Everyone knows that Ikea has really great and inexpensive items for your house, we have quiet a few Ikea items ourselves. But did you know that Ikea also has a Foundation that helps Children in need? Ikea has partnered up with Save the Children and Unicef, for every soft toy you buy Ikea donates $1 to help educate kids! This is a great way to give your child a gift and help other kids. Here are my boys with there Soft Toy Mr. 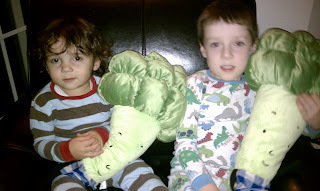 Broccoli Buddies, too cute! There are others to choose from like these Elephants and a few others. Go online and help Children in need, you will be glad you did. Save the Children and UNICEF have a gift that steps outside the box of “gifts that give back” -- I’d like to introduce you to IKEA's “18 inch plush veggie that Save the Children named “Mr. Broccoli.” The money raised will go towards giving children in Africa, Eastern Europe, and Asia access to quality education. Children and parents can follow Mr. 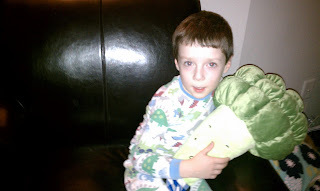 Broccoli's travels on Facebook and Twitter as he visits children around the world. The toys can be purchased in any IKEA store. Now available! The 2011 Save the Children Gift Catalog. Holiday shopping made easy. Shop Now at www.savethechildren.org/gifts. Those broccoli stuffed toys seem like an ingenious idea. Thanks for sharing how this can entice children to eat more vegetables with their meals.